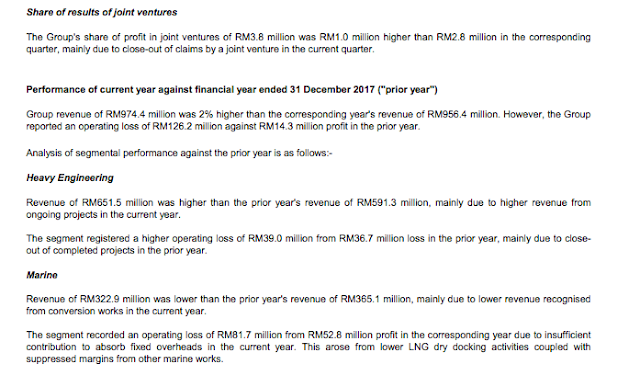 MMHE, a 66.5% owned subsidiary of MISC which in return is a subsidiary of our largest corporate, Petronas just reported a poorer results turning in a net loss of RM25 million for the 4th quarter from profits a year earlier. I do not invest into MMHE and I just would like to know the trend of the business. However to my dismay, it is not worth reading. Just see below from its financial performance announcement. What do we learn from this reporting? Nothing. I can get this done by a trainee employee, and I would not be satisfied. MMHE has 9 directors and I am sure professionally hired management but when can we expect professionally provided report? this is not being responsible! Steel fabrication industry industry is very tough..especially for OnG and maritim..tight requirement, high expertise and susceptible to currency fluctuate..